Epic poetry, Greek - Translations into English. 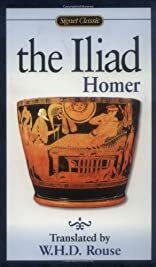 Focusing on the closing days of the Trojan War, this novel incorporates the same epic cast of gods and warriors from The Odyssey. From the kidnapping of Helen from her Greek home to the death of Achilles's companion, the battle rages between two warring nations and the gods which protect both sides. Thrilling in content, but literate and subtle in its meaning, The Iliad remains a classic among classics.